I love to enter those bazaar stores where you can find anything and everything. I love walking down their crowded aisles and trying to find a bargain or something that I could use (not always for its original intended purpose!). Many times I will find small containers or household items, or things that I can use at work (right now I am working with children), but it is also true that sometimes you can fing some hidden beauty gems! In this occasion I came home with an eyebrow razor, some pointed cotton swabs and a glass mini bowl. Right now I use a Make Up Store eyebrow razor and comb gadget, but honestly, at 0.75€ each, I’d rather take the bazaar ones! 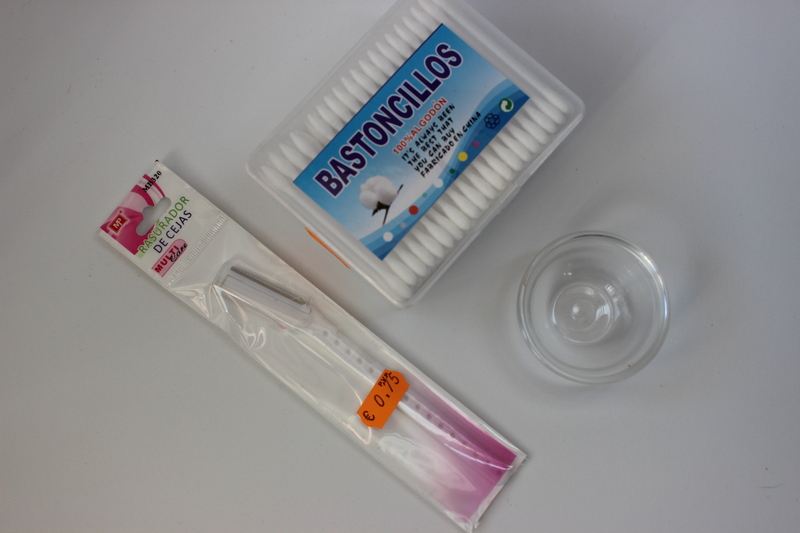 In my country you don’t find pointed cotton swabs very frequently, so when I saw these (and at only 0.90€) I grabbed a box. Perfect to clean little mistakes and to reach all kinds of corners. Finally, I have had the idea of a mixing palette in my mind for quite a while. But while I was in the store I saw this little glass bowl and thought that this could work as well! I have used quite a few times already and I really like it; I used to mix my foundations on the back of my hand but this is more convenient and cleaner. What about you? Any little treasures found in the cheap stores? Eyebrow razors give me the creeps, lol 🙂 I always worry that I’ll shave off half my eyebrow. Oh yes! I found three packets of good cotton the other day for less than 3 euros! You can PROBABLY find even cheaper stuff, but that’s the kind that feels rough on the skin and leaves fluff behind. When I saw the packs of three there, I wasn’t going to walk away without one!